So recently I was gifted a few things. 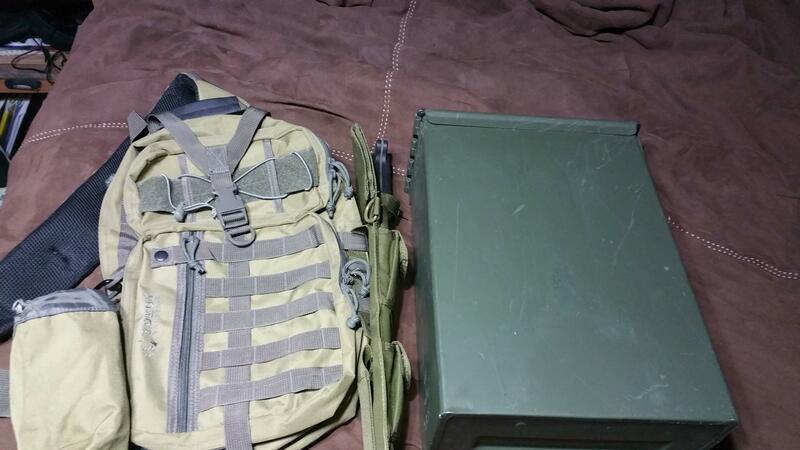 One of which was a Yukon Outfitters Overwatch Tactical Sling, and the other was a really big ammo can. So I'm trying to figure out what to put in them. Any suggestions? I love bigger ammo cans for tie downs and towing/hauling equipment. Also good for a "day box" with supplies such as food bars, water bottles, medical kit, etc. Kind of like an an emergency kit. the sling might make a good bag for misc crap when on a longer trip - something you can toss in the front seat to keep random stuff within an arm's reach but well contained. i use a range bag for that purpose myself - items like the camera, water bottle, Go Pro and mounts, camera charger, flashlight, small led lantern, daily medications, face or baby wipes, leatherman, couple of power bar type things, spare batteries, a$$ candy, etc.! The tactical sling would make a good bug-out bag for your Jeep. I have 2 of the large ammo cans. I keep ammo in them (duh) but that makes them too heavy to lug around. I was thinking of getting a MOLLE First Aid Kit to throw on there. As you can see, I already have my machete mounted on there. I may change that and just use a shoulder strap for the machete, but for now it works. I was also thinking of getting a MOLLE camera case for it since it has Molle straps on the sling strap. I'm just not sure what I should put inside it. Despite looking so small, it has a ton of space inside. The pouches REALLY expand. I may dedicate one of the smaller compartments to wires (charging wires, etc. But the rest is pretty much vacant. There is a spot for a water pouch, which the designers claim isn't for a water bladder, but seems suspiciously perfect for one. I may remove the machete just to make the pack more "public friendly" but I'm not sure if it would be great to haul such a big pack around anyways. As for the ammo cans, I was actually gifted a smaller one as well, and I have that chock full of Ammo and stuff for my Ruger. Using the large can for tie downs and such probably isn't a bad Idea.... I'll have to see how it fits. I have a TON of bungees and ratchet straps.